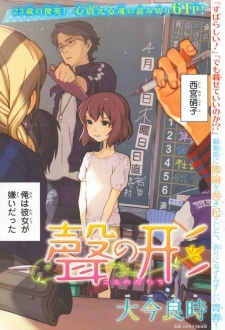 A one-shot about a grade school class that accepts a girl with impaired hearing. Although this one-shot won the 80th Weekly Shounen Magazine Newbie Best Mangaka Award, the vector of the content made it difficult for publication on any manga magazine, until it was picked up, after months of legal dispute, by the February edition of Bessatsu Shounen Magazine, where it got first place despite its being a one-shot. This one-shot was recently publicized again on the 12th edition of the 2013 Weekly Shounen Magazine.